NYC Ferry operated by Hornblower aims to provide a new, affordable way to travel between waterfront communities throughout New York City. The six routes span over 60 nautical miles of waterways and will connect New Yorkers and visitors to the city’s waterfront communities – including neighborhoods, job centers, and parks. With Wi-Fi, snacks, drinks, and more, every trip is a great experience! The service operates from 6:30AM to 10PM, 7 days a week, 365 days a year. The service operates from 6AM to 10PM, 7 days a week, 365 days a year. Remember to show your ticket to the deckhand before you board. You can purchase tickets on the app or the Ticket Machines at the landings. Schedules can be found in our NYC Ferry app and are available for download through the website at www.ferry.nyc. Departure schedules can also be found at every landing. Tickets are available for purchase through ticket machines. All transfers within the NYC Ferry system are free and valid for 90 minutes once you start your one-way trip. Round-trip journeys do not qualify for free transfers. Share photos and videos of your adventures with us via Twitter, Facebook and Instagram @NYCFerry. Alerts can be turned on with our NYC Ferry App. Children under the height of 44 inches can ride for free when accompanied by an adult. Please make sure children are accompanied by adults at all times. Stroller parking is available onboard. Travel safe! Follow the safety procedures to ensure the best quality experience. 5 Bringing a Bike Along? Ferries are 86 ft. long, offering riders more space than traditional ferries. Ferries are primarily built out of aluminum, a lightweight material that increases fuel efficiency. The fleet of 20 vessels will be built with an equivalent of over 77 million cans of aluminum. All ferries are equipped with ultra-efficient T3 engines to reduce emissions. There are 129 seats inside and 28 seats on the outer deck. As you take in the sea air and have a little celebration because you’re not underground or stuck in traffic, why not consider how much your commute has changed. But while the new ways to get around New York are exciting, the rest of the commute is still the same. We’re trying to fix that. 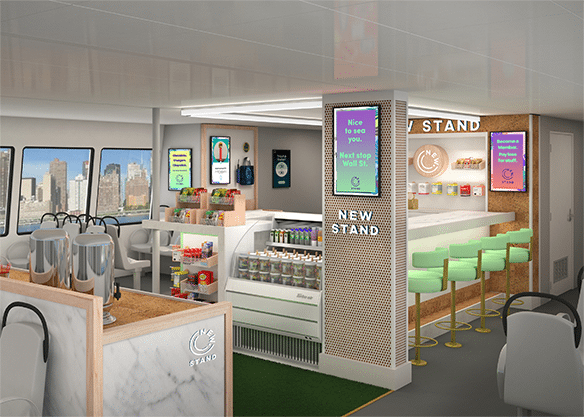 Born in the subway in 2015, The New Stand is one part curated convenience store and one part mobile media machine. It’s kind of like your favorite bodega and favorite blog had a baby. 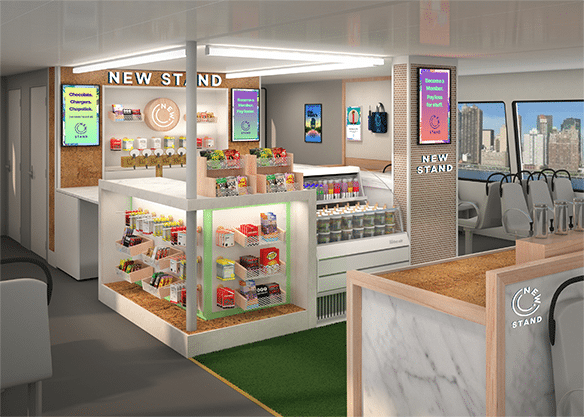 In our shops you’ll find the tastiest snacks and drinks, essentials from sunblock to phone chargers, and a rotating mix of tech, fashion, health and other products all geared towards the commuter. Our free app is restocked every morning with the best articles, stories, product drops and music releases that our newsroom can dig up. Convenience is everything to us, so you can also use our app for a speedy check out, weekly deals and to build up loyalty points that you can spend at the stores. We hope to become a part of your daily routine by getting you exactly what you need while introducing you to a few new things along the way. Thanks and have a new day! We are a dedicated team that works hard to ensure your safety while you travel around the city with NYC Ferry operated by Hornblower. Our entire crew is excited to have you aboard and help you enjoy an amazing experience throughout your ride. We connect the waterfront communities of Brooklyn, Manhattan, Queens and the Bronx everyday. We may be riding in style but it doesn’t mean that we don’t have rules. Lost something? Please fill out the Lost and Found form here and someone will get back to you regarding your lost item.